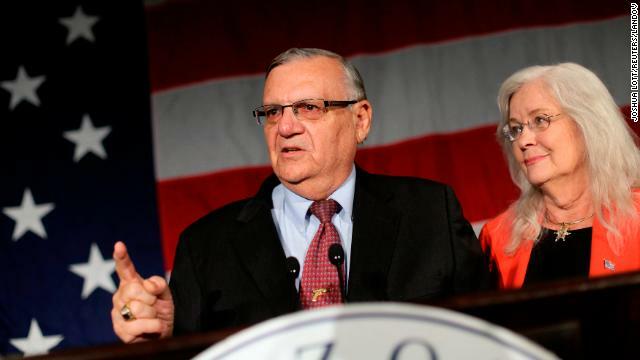 Maricopa County Sheriff Joe Arpaio speaks next to his wife Ava Arpaio on election night in November. Authorities intercepted a suspicious package with explosives that was addressed to tough-talking Arizona Sheriff Joe Arpaio. U.S. Postal Inspector Andrew Rivas in Flagstaff screened the package Thursday and realized it was suspicious enough to call the local police bomb squad and the FBI. "We evacuated the post office, got all our employees to safety," Rivas told CNN affiliate KTVK. The Maricopa County Sheriff's Office said Flagstaff police X-rayed the package and neutralized it Thursday night. Did you dust the package for Obama's and Holder's fingerprints? You do realize that it was a US government agency that intercepted and neutralized that package don't you/ Or are you just too pathetically paranoid to understand the truth? Are you really that ignorant to see that the government hides things, lies to you constantly, and does stage events such as this. Look at 9-11, there is no possible chance some random musslum walked onto a airplane tarmac stole a plane took his sweat time slying to the towers and blowing them up. Air force would of screwed him up wayy before he made it. Plain and simple. Thats not even the hard evidence that it was staged that is all over the internet. Evidence is truth. Some people cant handle the truth. You seem like one of those people. There seems to be something partially blocking your airway and preventing an adequate supply of oxygen from reaching what's left of your brain. You've probably swallowed your tongue again. Don't panic, just ring your little bell and the orderly will come in and flip you over. Wasn't the last bomb a political stunt carried out by Arpaio himself? This might be related to the bombing attacks in Boston. Or what have we? That should really be weird why they would have explosives mailed to them. I'm sure that Arpaio sent this to himself. The "bomb" was probably supposed to go off in the post office. No one is afraid or cares about Arpaio, so no one would want to hurt him.